As the colder air draws in, my skin is starting to get a little more agitated – blemishes take longer to heal and that summer glow is well and truly gone. So I’ve been majorly stepping up my Face Mask game, trying out hundreds (OK not quite) of different masks to find the best of the bunch. 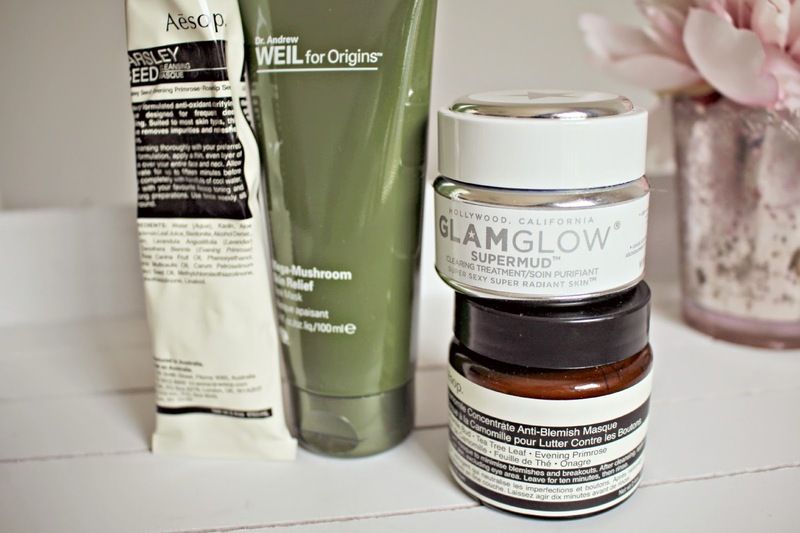 My fabulous four are the Aesop Parsley Seed Cleansing Masque, The Dr Andrew Wiel for Origins Mega-Mushroom Skin Relief Mask, as well as Aesop’s Chamomile Concentrate Anti-Blemish Masque and finally GlamGlow‘s legendary Super Mud. If my skin is feeling a little neglected, perhaps I’ve had a few late nights out, or I’ve not been taking enough care with my skincare routine, then I will reach for the Aesop Parsley Seed Cleansing Masque. Used regularly, the Masque makes my skin so much more manageable – I notice less blemishes and my skin looks clearer and brighter. Unlike some other clay masks, I don’t find my skin feels dry after using it. 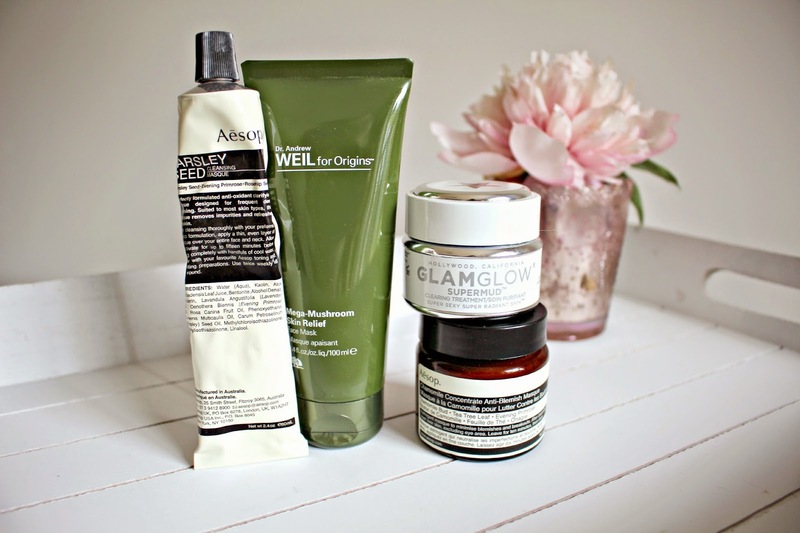 This mask was the first Aesop product that I’d purchased before, and I loved it so much that I then decided to invest in the Chamomile Concentrate Anti Blemish Masque. The Parsley Seed mask is £27 and you can buy it from Net-a-Porter.com. The Aesop Chamomile Anti Blemish Masque really works well on my blemishes. I use it only on the specific areas that I want to treat (it’s quite pricey so best to only treat the areas needed!) I use a cotton bud to apply the mask to the specific areas and leave on for up to 20 minutes before removing with a warm flannel or just warm water in the shower. It speeds up the healing process of my blemishes and immediately calms the inflammation. This Masque is £33.00 and you can get it online from ManKind here. The Origins Mega Mushroom Skin Relief Mask really calms my skin and reduces any redness or blotchiness. It gives my skin an instant boost of moisture and I find it makes my makeup look much better and last longer after I’ve used it. It’s a rich and creamy mask, it feels more pampering than the clay masks and has a herbal fragrance which hints to the ingredients within the Mask (mushroom blend, bamboo leaf extract and Marine Algae!). It has a cooling sensation when applied – it certainly wakes you up! I found it odd to begin with that the mask doesn’t dry or harden, but my skin feels quenched and moisturised, as opposed to the mask being oil absorbing. After leaving the mask on for 10 minutes, and washing off wit warm water, my skin looks and feels calmer, and my face feels refreshed and soft – it’s ideal for Sunday mornings, or times when your skin feels dull or dry. I’ll be reaching for this a lot more frequently as the weather turns colder! The Mega Mushroom Skin Relief Mask is £36 from Origins here. I’ve saved the best til last. I can not rave enough about the GlamGlow Super-Mud Mask – this is the first face mask that I’ve tried that gives a really noticeable improvement to my skin (looks as well as feels) – the first time I used it, I kept looking in the mirror and looking back in amazement at the difference a Mask can make. Super-Mud gives your skin double hit – the mud deep cleanses, while the acids exfoliate skin. I don’t use it too regularly, but rather save it for when my skin is in need of some SOS, or if I have a special occasion that I need my skin to be perfect for. It’s ideal for my combination/oily skin as it deep cleanses my pores, but friends that have dry skin that have tried it tell me that they find it fab at brightening and tightening skin. I think the Super-Mud mask needs to be incorporated into a full skincare routine – you can’t just apply it and expect miracles, but if you put in the ground work then this mask will really pay off! Glam Glow Super-Mud is £45 from M&S here. I hope my mini guide to luxury face masks helps you decide which one is right for you, if you discover a mask that you think I need to try, let me know! Next Post October GlossyBox – The Pop Art Edition!